ZIF5031 Z-Wave DIN rail module, is a module that clips right onto a DIN rail to add a variety of functions to you wireless Z-Wave network. ZIF5031 is equipped with 10 relay outputs and 4 analogue inputs, and a Z-Wave radio for interfacing to the wireless Z-Wave network. The module can be power supplied from a 230V AC mains connection, and is able to deliver an output supply of 24V DC. ZIF5031 relay outputs are able to be freely controlled from the Z-Wave network, and can be used for several purposes, e.g. on/off control of light, control of valve actuators for an underfloor heating system, or control of other home automation systems. ZIF5031 inputs are analogue inputs for interfacing simple temperature sensors; NTC, PT1000, etc. 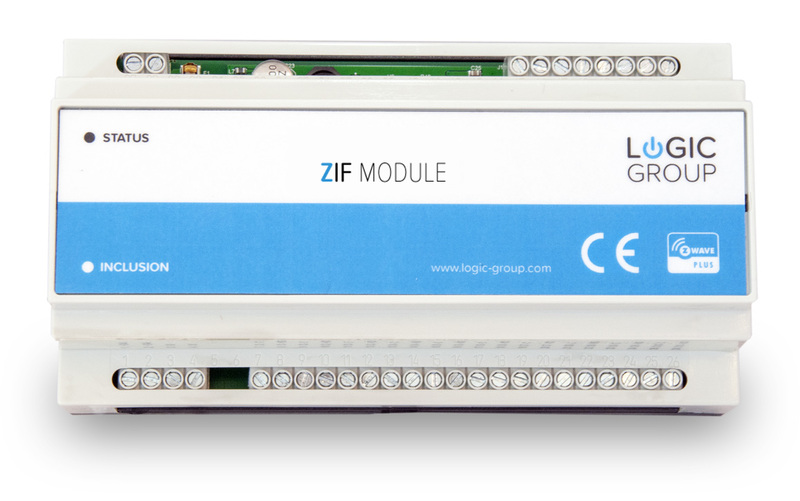 The light in the LED status indicator in front of ZIF5031 can be configured from the Z-Wave network. Logic Group offers various home automation products that easily integrates with a wide range of existing Z-Wave products. Our products improve comfort, save energy and protect your home.